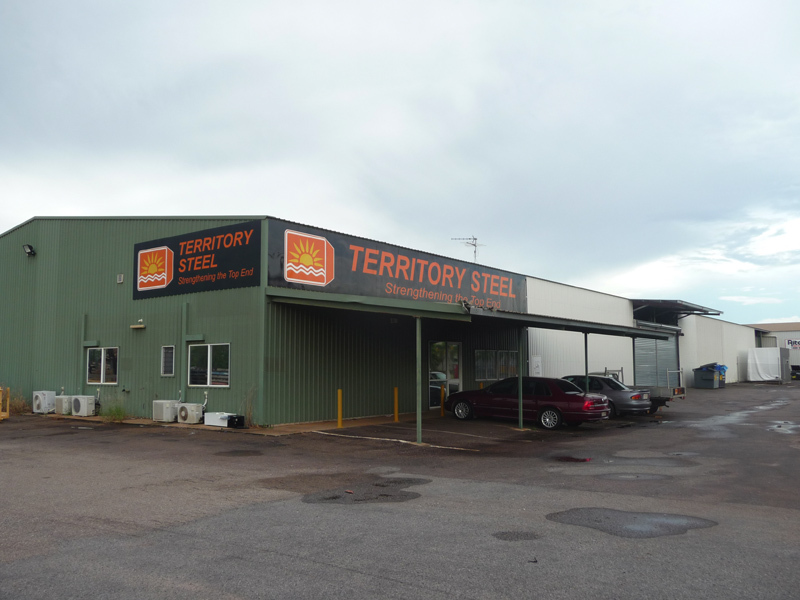 Territory Steel is a locally owned and operated steel distribution and processing company in Darwin, supporting all areas of the Northern Territory and northern Western Australia. Commencing in 2005 Territory Steel has grown from humble beginnings to a full service steel provider. With a focus on working with our clients, Territory Steel has been able to engage in projects that have influenced Darwin and the Territory. Projects such as the Alcan G3 expansion in Gove and the Darwin Waterfront redevelopment are an example of this. We are suppliers of Universal Beams, Universal Columns, RHS, SHS, pipe, flats, angles, round bar, plate and sheet metal, roofing products, reinforcing, fasteners, sliding gates and doors, welding accessories and manufactures of wall framing material. With our ability to cut to size our clients enjoy reduced waste on site and a safer work environment. With three bandsaws and a punch and shear we are able to provide a fast and efficient turnaround on orders. Coupled with two crane trucks we are able to deliver orders safely and on time. In 2009 a we commissioned a steel stud wall mill to which has the capacity to produce the 75 series, 90 series and 100 series Stud, Nogging and Plate. November 2010 we secured a relationship with Bremick Fasteners that has resulted in Territory Steel now being able to supply a full package of goods to its clients thus improving our service capabilities. For your next project large or small please contact us or visit us at 11 Toupein Road Yarrawonga.